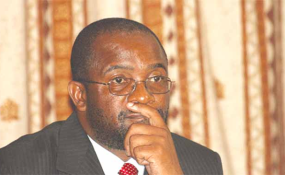 MDC Alliance Secretary-General Douglas Mwonzora. After MDC Alliance leader Nelson Chamisa announced that the party will hold its congress between May 24 and 26 to choose the late Morgan Tsvangirai's successor, interest in who will be the next leader of Zimbabwe's main opposition party has ballooned. Chamisa, who took over from Tsvangirai under controversial circumstances following the former prime minister's death in February last year, went on to give President Emmerson Mnangagwa a good run for his money in the disputed July 30, 2018 elections. Since then, the 41-year-old leader's stock has been rising and some in the MDC Alliance strongly believe he has no challenger in the race to fill Tsvangirai's shoes, but party secretary-general Douglas Mwonzora's name is being mentioned in other quarters as a worthy challenger. However, Mwonzora (DM) told our senior reporter Obey Manayiti (OM) in an exclusive interview that he was yet to make up his mind on which position he will contest at the congress. He spoke at length about claims that he is being backed by Zanu PF, which is reportedly desperate to checkmate Chamisa, and allegations that his ambitions have spoiled his relations with the party leader. Below are excerpts from the interview. OM: Why do you think Zanu PF leaders such as youth deputy secretary Lewis Matutu and others have come out on social media saying you will be a better MDC Alliance leader than Nelson Chamisa? DM: I had time to study the statements by various Zanu-PF officials and members of the public. I haven't seen where the Zanu PF (officials) said they support me. The comment I saw was the one by Mr Matutu with his prediction that I was going to win. Now that is a prediction and not support. I also looked at a follow-up tweet that he made when he was asked and he said he doesn't like me and he doesn't like Advocate Chamisa as well, so it is not support. I am sure the people have now gone into this debate of who will lead the MDC because it is interesting. I have no support from Zanu PF, I do not want that support as well. I rely on the members of MDC who know me better and who know my history. OM: Have you made up your mind now on which position you are going to contest at the congress? DM: I think now my mind is almost made, but I am still consulting within the party. I am consulting the structures, the districts and I am almost through with the districts now. I have consulted the provinces and I am through. I have an idea of where they want me to be deployed and I am going to be making an announcement when the time comes, but let me say that as a member of the MDC I have my rights to contest whatever position my party thinks I am suited for. The best people who know me and know what I am capable of are my colleagues within the party and they are going to deploy me definitely. OM: Do you think there is a plan by Zanu PF to meddle in MDC affairs and influence the outcome of the party's internal elections at the congress as reported by some media outlets? DM: What I know is that Zanu PF people are afraid of my candidature because Zanu PF has dealt with me for quite a long time as a member of the opposition. This is the party that has detained me for over 34 times, starting with my detention at Whawha in 1990 and another detention in Mutare when I was heading Copac (Constitution Parliamentary Committee). I am sure as chairperson of Copac I must have given Zanu PF a few sleepless nights. I have a formula for defeating that party. I defeated Zanu PF first as a member of ZUM (Zimbabwe Unity Movement) and fought against a one-party state and we won. In 1989-90, we fought against a one-party state and I was a member of the students' union as well as a member of ZUM, where I was in the executive as presidential spokesperson. We were able to defeat Zanu PF in its one-party state agenda. In 1997 I took the government to court over the constitutionality of the Political Parties Finance Act and I successfully challenged it in the Supreme Court, which was the Constitutional Court on that occasion. I have been a member of the MDC and as a member of Copac we have had our new constitution and it came via the leadership I offered to my colleagues. So I am not doubtful regarding what I can achieve. I think I do possess the abilities of strategic thinking and strategic planning. I think I will be more difficult for the Zanu PF people. OM: Are you not worried that this open support from Zanu PF officials and supporters will harm your reputation in the eyes of MDC Alliance supporters? DM: Nobody who is fair and sensible will think for a minute that I have anything to do with Zanu PF at all. This is cheap propaganda that is coming from my detractors, people who cannot fight a fair battle even within the organisation. Everybody knows I am a loyal member of the opposition and there is no reason why true MDC people must allow themselves to be digressed by what Zanu PF is saying. We in the MDC say quite a lot of things about the Zanu PF leaders. We talk about who is more cruel, (Vice-President Constantino) Chiwenga or (Vice-President Kembo) Mohadi or (President Emmerson) Mnangagwa, we say it all the time. We even say who is a better leader among the three of them. We always say it all the time, but it doesn't mean that we support them. In fact, when (Robert) Mugabe was still president there were a lot of Zanu PF people that we thought would be better presidents, but that doesn't translate to support for that candidate. I am not a member of Zanu PF and I do not require their support. When Victor Matemadanda talked about the MDC congress, I issued a statement in which I castigated him. I do not know why people choose to believe Zanu PF when it comes to me, but I am not very worried because MDC people know the truth. OM: What is your reaction to people who say Chamisa must not be contested because of his performance in last year's presidential elections? DM: Well, there is no doubt that Nelson has done well -- not necessarily as president of MDC, but as a leader within the party - his days within the youth assembly, as spokesperson, organising secretary, as vice-president and as president. So I don't want to take anything away from him. He is a good man, he is a hard worker. When the time comes I will make my decision on whether to challenge him or not and if I am to challenge him, I must offer better leadership. If I think I can offer better leadership, better strategic thinking, then I will be able to offer it, but at no point am I going to take away the achievements that he made. Neither should people take away the achievement, which I made within the MDC as a member of Copac, as a member of the inter-party dialogue bringing in the code of conduct and dealing with the BVR (biometric voter registration) system. We were together in the demonstrations that we planned in this country and all those are successes that I share as well. OM: There are reports that you have aligned yourself with MDC Alliance chairperson Tabitha Khumalo in a bid to capture Matabeleland. Does this mean you have reservations about the return of Welshman Ncube into the fold? DM: The report is false. I have worked with Tabitha Khumalo since our days in the ZCTU (Zimbabwe Congress of Trade Unions). As you know, I was legal advisor to the ZCTU and she was a member of the general council, so we come from very far with her. We were together in the National Constitutional Assembly fighting for the new constitution and we campaigned for the "No Vote" together. We have been in this democratic struggle together. I know Tabitha as a person of solid thinking and sometimes I agree with her, but sometimes I don't. So there is no plan between the two of us to capture Matabeleland because we don't want to capture anybody, we want to lead people. Maybe this is coming from the stance, which Tabitha and I took on the ward 28 by-election (in Bulawayo). Tabitha and myself said we do not want imposition of candidates, the people in ward 28 have through a primary election to vote for a candidate of their choice and we stand for the sovereignty of the people. Professor Welshman Ncube is a good constitutional lawyer and no doubt about it and I have no fight with him. OM: Has your relationship with Chamisa not been affected by the rumours about your alleged bid to challenge him? DM: First, I don't suddenly become Zanu PF because we have a congress and, secondly, I am sure people have seen how intolerant some elements within my party can be. If it is true that I was working with Zanu PF, God knows if I would still be alive and still in the party right now. Why am I not being disciplined, why not be expelled and why am I being allowed to run the party as secretary-general? This shows that my colleagues know that these rumours are false. Chamisa himself knows that these rumours are false. Now coming to the issue of competition, Chamisa has always had competition. This happened when he took over as youth leader, competition when he wanted to be spokesperson, competition when he took over as organising secretary, competition when he tried to be secretary-general. He has always had that competition and it doesn't, in my view, scare him that there could be competition. This is the essence of democracy. The relationship between him and me is one of mutual respect. I am sure he respects me and I respect him as well. I don't think it has been affected. The aim of people who have been peddling these lies is to try to affect our relationship and unfortunately we have seen through it. We have seen also other leaders, maybe trying to cover for their historical misdeeds, calling me half-wit and nincompoop on social media and that is uncalled for. That is barbaric and it is not something that we expect from mature leaders. Mature leaders must know that we now have jettisoned the politics of hate, we are now in the politics of rational disputation. OM: There have been reports about alleged attempts to elbow you out of the party by leaders aligned to Chamisa. What has made you survive this long? DM: There were spirited attempts last year to get me out of the party. At almost every national executive meeting and national council, there were people who tried to push for the removal of the secretary-general and, of course, it didn't succeed because I had no case to answer in the first place. Secondly, the membership of the MDC could not allow that. So my work speaks for itself and I have discharged my duties well as spokesperson of the party, as its deployee in Copac, as MP and secretary-general. I will continue to survive because I am loyal to the organisation. I do not backbite people. OM: In your view, what will it take for the MDC Alliance to win against Zanu PF in the next elections? Do you think the party has the capacity to dislodge the ruling party? DM: MDC can easily defeat Zanu PF, but it has to make sure that it has strategic alignments. First, it must set targets for itself. Under president (the late Morgan) Tsvangirai in 2015, I was tasked to do a strategic paper for 2018 and I came to the conclusion that in order to put our victory beyond question, we had to aim at 4,5 million votes. Once you set yourself a target, then you must work towards that target. Secondly, the MDC can win if it allows robust internal debate because this is how you get the best ideas. We must never get to a situation where people get so frightened to contribute because they think the leadership may not want it. We have to increase democratic debate. We have also to work with others outside the party, we have to focus less internally and more on the external. MDC has the capacity to win and win hands down, now what we must limit is hate language, especially from amongst the leaders on social media. That is not helpful to our party. OM: What would you consider to be the biggest mistakes made by the MDC since its formation in 1999 and what could have the party done differently? DM: Under the circumstances, the MDC has done very well, but I think we need to do better in areas of selection. We must remove individual discretion on the issue of candidates. So we will have to strengthen the institution of primary elections as a primary determinant of candidacy. We also have to allow democratic debate. One of the mistakes that we made was to go into the government of national unity without having properly negotiated the sharing of the bureaucracy. We had a situation, therefore, where we had ministers of MDC presiding over Zanu PF bureaucracies. So if we are to have to do power-sharing next time, we have to make sure that we understand where the power lies in the institutions of the state, in the army, in the CIO (Central Intelligence Organisation) and in the police. As long as you have a political police, political army, then the negotiations regarding power have to extend to those organs as well. OM: If you are nominated for the presidency, are you going to accept the nomination? DM: There are a number of factors to consider such as the number of nominations, the circumstances under which I am nominated, the performance of the other candidate, the interest of the majority of party members. All those factors I will consider. I am aware that at the last congress I won with one nomination, but I don't want to have this problem of the burden of past victories. Past victories mean nothing, we are now in the future and the terrain has changed and people get wiser as well. So I will really listen to the members of the MDC. For me at this point in time, I am the slave of the people. I am a slave of the members of the MDC and they will deploy me where they think I am most suited.